We were in New York last weekend, and I finally had a chance to deliver Robbie's first birthday sweater. Here's a little backstory. Robbie is completely and totally obsessed with cars. "Car" is the word he says most often, most clearly, most accurately and -- did I mention often? From the moment he wakes up in the morning until the moment he drifts off to sleep at night, it's a stream of "car.... car? ...CAR!... caaaaar..." It's really cute. Now the sweater. 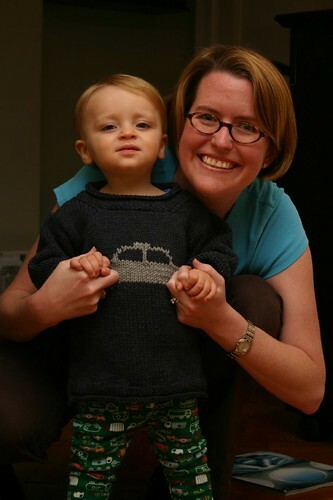 I decided to make him a cuddly, over-sized sweater and I had the perfect dark-grey All Seasons Cotton in my stash. I used the Mickey pattern (so familiar from when I made it for Robbie before he was born!) as a general guide. The dark grey knit up beautifully, but once I was a few inches up the front I knew that it needed something more. I made a quick trip to my new (!) LYS for an on-sale ball of light grey ASC and spent a bit of time with some graph paper to come up with the perfect sweater for the Robster. In addition to cars, Robbie also loves to walk. He won't really walk unless he's holding on to a hand, so Sunday night after dinner Jason and I walked all the way back to Robbie's apartment with him toddling between us, with one index finger in each chubby fist. It was so fun! 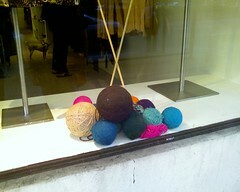 On the last block of the walk, I spotted this in the window of a little clothing store. The next day I went back and snapped a picture; if you look closely, you can see something quinessentially New York. Go ahead, click -- see if you can find it! I wonder what can be. I can't find anything! Look in the background. Look at the floor and you'll see something that's not supposed to be in a clothes store. Awww, it came out great! Good lookin' boy too! The sweater is so sweet - great job! I like the color combo as well. i know, i know.......it's the way the knitting needles are arranged, as a memorial to the twin towers.